It is fall once again. That means a great many things, but what it really means is a whole lot of new TV episodes to watch. We are in what many call a television renaissance and that is all good and well, but there is still nothing quite like a great animated show. In the current TV landscape, there is plenty of great animated shows to watch this fall as well. For years, Cartoon Network's Adult Swim and Fox have been putting a lot of effort into making great animated shows that are for a more mature audience. While some of these are totally inappropriate for kids, quite a few of them are perfectly ok for younger folks to watch and just so happen to provide a few more layers for adults to enjoy. 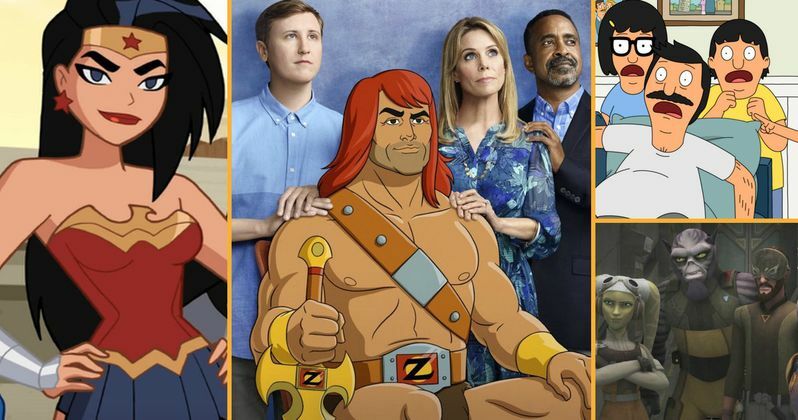 This fall is a pretty mixed bag for those who love animated TV shows. There are a few new shows to watch out for, but there are a tong of returning favorites that we can't wait to get back to. Some shows this season may seem as though they are close to overstaying their welcome, but they may very well still have some gas left in the tank. On the other hand, some of these shows are looking to potentially enter their golden age and are primed for some of their best seasons yet. In either case it should make for plenty of interesting animation to enjoy. Fox and Adult swim are pretty strictly providing comedic animated television, which nobody is really complaining about. Thanks to the likes of Seth MacFarlane, Matt Groening and Dan Harmon, we have been presented with tons of excellent hilarious animated TV shows. So why fix what isn't broke? But Cartoon Network and Disney XD may have a thing or two up their sleeve this season for those looking for something a little more serious in the animated world this season. Some of these shows are ending and some of them are just beginning, but all of them present something that makes them worth tuning in for. Sure, you know you can tune into AMF, FX or HBO most nights and catch some excellent live-action TV, but there is just something so satisfying about a great cartoon. From animation set in against a backdrop of live-action to a show set in a galaxy far far away, here are the 9 animated shows you should be watching this fall. We all know that Disney is planning to bring us plenty of Star Wars goodness to the big screen for the foreseeable future, but one of the best things they have done for Star Wars fans so far is Star Wars Rebels. Anyone who has kept up with the show knows that, especially by the end of season 2, this isn't just an animated show for kids that adults can use to fill the void until a Star Wars movie arrives. This show is a genuinely great addition to the Star Wars universe. The season 2 finale may have been one of the better things Disney has given us since they purchased Lucasfilm and that makes us intensely excited for season 3. We know Darth Maul will be back but most importantly, Dave Filoni is bringing us Grand Admiral Thrawn. If you have had any hesitations about watching Star Wars Rebels, set them aside and get caught up so you can enjoy what's to come in season 3.